June 1996 – A diploma of a two-semester course in management and business organized by the Institute of Applied Economics in the Faculty of Law and Administration at the Jagiellonian University in Cracow. 2017 - 2020 - Key Investigator – The National Science Centre – 2017/25/B/HS4/01058 – The impact of commodity markets uncertainty on real and financial process in countries at different level of economic development ( Principal Investigator: dr hab. Śmiech Sławomir). 2016-2019 – Principal Investigator – The National Science Centre – 2015/17/B/HS4/02685 – The impact of European Union's energy policy on the economic growth in its member states (Key Investigator: dr hab. Śmiech Sławomir). 2016 - 2019 - Key Investigator – The National Science Centre – 2015/17/B/HS4/02681 – A reliable de facto exchange-rate-regime classification: construction and application to evaluation of a link between exchange rate elasticity and output volatility ( Principal Investigator: dr hab. Dąbrowski Marek). 2014 - 2015 - Key Investigator – The National Science Centre – 2013/11/B/HS4/00489 – Causal relations between nominal exchange rates and their fundamentals in European emerging economies - an approach based on the class of present-value models ( Principal Investigator: dr Dąbrowski Marek). 2013-2016 – Key Investigator – The National Science Centre – 2012/07/B/HS4/00700 – Causal relations between commodity prices and macroeconomic and financial indicators in the context of structural breaks in the international commodity markets (Principial Investigator: dr Śmiech Sławomir). 2012-2015 – Principial Investigator – The National Science Centre – 2011/03/B/HS4/01134 – Modelling and Forecasting Prices of Energy Sources in View of Poland’s and Europe’s Energy Security (Key Investigator: dr Śmiech Sławomir). 2005 – 2006 – Contractor of the project (grant promotorski) KBN Grant 1 H02B 003 28, No 0201/H02/2005/28 – Statystyczne metody oceny ryzyka ubezpieczeniowego planów emerytalnych (Project manager: Prof. dr hab. Aleksander Zeliaś). 1998 – 2000 - Contractor of the project - KBN Grant 1 H02B 001 13 – Taksonomiczna analiza przestrzennego zróżnicowania poziomu i jakości życia w Polsce w ujęciu dynamicznym, (Project manager: Prof. dr hab. Aleksander Zeliaś). 2005 – Team Award of the Minister of National Education and Sport for the book, „The standard of living in Poland and the European Union”, (co-author), Warsaw, October 2005. 2000 – Team Award of the Rector of Cracow University of Economics of first degree for achievements in science in 2000 (Cracow, October 2001). Papież, M., Śmiech, S. (2015). Modelowanie i prognozowanie cen surowców energetycznych. (Modelling and forecasting prices of energy sources). Wydawnictwo C.H. Beck, Warszawa. (Papież, M.: wstęp, zakończenie (współautor); rodz. 2; rozdz. 3.5; rozdz. 4; rozdz. 5; rozdz. 7). Denkowska, S., Papież, M. (2011). Rachunek prawdopodobieństwa dla studentów studiów ekonomicznych. (Probability theory for students of economics). Wydawnictwo C.H. Beck. Warszawa. Malina, A. (red.) (2008). Przestrzenno-czasowa analiza rynku pracy w Polsce i krajach Unii Europejskiej. (Spatio-temporal analysis of the labor market in Poland and EU member states). Wydawnictwo Uniwersytetu Ekonomicznego w Krakowie, Kraków. (Papież, M.: rozdz. 2 (współautor), rozdz. 7, rozdz. 10 (współautor)). Zeliaś, A. (red.) (2004). Poziom życia w Polsce i krajach Unii Europejskiej. (The standard of living in Poland and EU member states). PWE, Warszawa 2004. (Papież, M.: rozdz. 2 (współautor), rozdz. 5.3; 5.5 rozdz. 7.2; 7.6). Zeliaś, A. (red.) (2000). Taksonomiczna analiza przestrzennego zróżnicowania poziomu życia w Polsce w ujęciu dynamicznym. (Taxonomic analysis of spatial differences in the standard of living in Poland in a dynamic approach). Wydawnictwo Akademii Ekonomicznej w Krakowie, Kraków. (Papież, M.: rozdz. 5 (współautor), rozdz. 7 (współautor)). Śmiech, S., & Papież, M. (2017). In search of hedges and safe havens: Revisiting the relations between gold and oil in the rolling regression framework. Finance Research Letters, 20, 238–244 http://dx.doi.org/10.1016/j.frl.2016.10.006, (MNiSW-15 pkt) (IF 5-Year 0.639). Śmiech, S., Papież, M., & Fijorek, K. (2016). Causality on the steam coal market. Energy Sources, Part B: Economics, Planning, and Policy, 11(4), 328-334. (MNiSW-15 pkt) (IF 5-Year 0.682). Śmiech, S., Papież, M., Dąbrowski, M. A. (2015). Does the euro area macroeconomy affect global commodity prices? Evidence from a SVAR approach. International Review of Economics & Finance, 39, 485-503. http://www.sciencedirect.com/science/article/pii/S1059056015001197 (MNiSW-25 pkt) (IF 5-Year 1.397). Dąbrowski, M. A., Papież, M., & Śmiech, S. (2015). Causal relations between nominal exchange rates and monetary fundamentals in Central and Eastern European countries. Economics of Transition, 23(1), 45-73. http://onlinelibrary.wiley.com/enhanced/doi/10.1111/ecot.12055/ (MNiSW-20 pkt) (IF 5-Year 0.774). Dąbrowski, M. A., Śmiech, S., & Papież, M. (2015). Monetary policy options for mitigating the impact of the global financial crisis on emerging market economies. Journal of International Money and Finance, 51, 409-431. http://www.sciencedirect.com/science/article/pii/S0261560614002204 (MNiSW-35 pkt) (IF 5-Year 1.916). Papież, M., (2015). Is it possible to successfully forecast the real price of crude oil at short horizons? In: Papież, M., Śmiech, S., (eds. ), Proceedings of the 9 th Professor Aleksander Zelias International Conference on Modelling and Forecasting of Socio-Economic Phenomena. 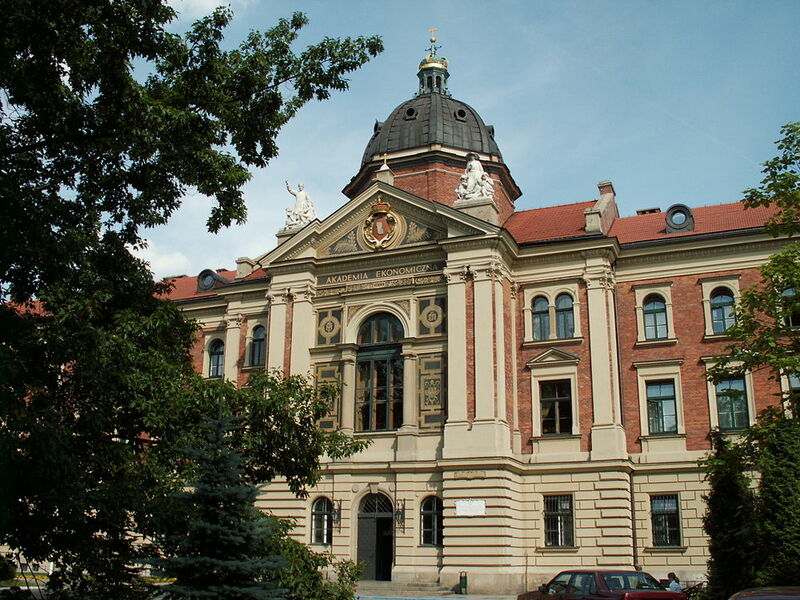 Cracow: Foundation of the Cracow University of Economics, 154-163. http://pliki.konferencjazakopianska.pl/proceedings_2015/proceedings.html (MNiSW-15 pkt). Wanat, S., Papież, M., & Śmiech, S. (2015). The Conditional Dependence Structure between Precious Metals: a Copula-GARCH Approach. Zeszyty Naukowe Uniwersytetu Ekonomicznego w Krakowie, 940(4), 19-33. https://zeszyty-naukowe.uek.krakow.pl/article/view/494 (MNiSW-11 pkt). Wanat, S., Papież, M., & Śmiech, S. (2015). Causality in distribution between European stock markets and commodity prices: Using independence test based on the empirical copula, [w:] K. Jajuga, W. Ronka-Chmielowiec (red. ), Inwestycje ﬁnansowe i ubezpieczenia – tendencje światowe a polski rynek. Prace Naukowe Uniwersytetu Ekonomicznego we Wrocławiu, (381), 439-454. https://www.ceeol.com/search/article-detail?id=284140 (MNiSW-11 pkt). Papież, M., (2014). Długookresowe zależności na rynku otwartych funduszy emerytalnych [w:] J. Lisowski, K. Łyskawa (red.) Ubezpieczenia wobec ryzyka długowieczności / starości, Wydawnictwo Uniwersytetu Ekonomicznego w Poznaniu, Poznań, s. 123-132. Wanat, S., Papież, M., & Śmiech, S. (2014). The conditional dependence structure among precious metals: a copula-GARCH approach, in: Talašová, J., Stoklasa, J., Talášek, T., (eds.) Proceedings of 32nd International Conference Mathematical Methods in Economics. Faculty of Science Palacký University, Olomouc, Olomouc, Czech Republic, 1096-1101. PDF http://www.mme2014.upol.cz/downloads/MME_2014_Proceedings.pdf (MNiSW-15 pkt). Dąbrowski, M.A., Papież, M., Śmiech, S. (2014). Exchange rates and monetary fundamentals in CEE countries: evidence from a panel approach. Journal of Macroeconomics 41, 148-159 http://dx.doi.org/10.1016/j.jmacro.2014.05.005 (MNiSW-25 pkt) (IF 5year 0.968). Śmiech, S., Papież, M. (2014). Energy consumption and economic growth in the light of meeting the targets of energy policy in the EU: The bootstrap panel Granger causality approach. Energy Policy 71, 118–129 http://dx.doi.org/10.1016/j.enpol.2014.04.005, (MNiSW-35 pkt) (IF 5year 3.402). Śmiech, S., & Papież, M. (2014). Energy consumption and economic growth in the light of meeting the targets of energy policy in the EU. In: IEEE Conference Proceedings, 11th International Conference on the European Energy Market (EEM14), PDF. Śmiech, S., Papież, M., Dąbrowski, M.A. 2014. Energy and non-energy commodity prices and the Eurozone macroeconomy: a SVAR approach. In: Papież, M., Śmiech, S., (eds. ), Proceedings of the 8 th Professor Aleksander Zelias International Conference on Modelling and Forecasting of Socio-Economic Phenomena. Cracow: Foundation of the Cracow University of Economics, 165-174. http://www.pliki.konferencjazakopianska.pl/proceedings_2014/pdf/Smiech_Papiez_Dabrowski.pdf (MNiSW-15 pkt). Wanat, S., Papież, M., & Śmiech, S. (2014). Causality in distribution between European stock markets and commodity prices: Using independence test based on the empirical copula. MPRA Paper 57706, University Library of Munich, Germany. - working paper version is available from RePEc: https://ideas.repec.org/p/pra/mprapa/57706.html. Papież, M., (2014). A dynamic analysis of causality between prices of corn, crude oil and ethanol. MPRA paper 56540, University Library of Munich, Germany - working paper version is available from RePEc: http://ideas.repec.org/p/pra/mprapa/56540.html. Wanat, S., Papież, M., & Śmiech, S., (2014). The conditional dependence structure between precious metals: a copula-GARCH approach. MPRA paper 56664, University Library of Munich, Germany - working paper version is available from RePEc: https://ideas.repec.org/p/pra/mprapa/56664.html. Papież, M., & Śmiech, S. (2013). Causality in mean and variance within the international steam coal market. Energy Economics 36, 594–604. http://dx.doi.org/10.1016/j.eneco.2012.11.004 (MNiSW-45 pkt) (IF 5-Years 3.291). Śmiech S., & Papież M. (2013). Fossil fuel prices, exchange rate, stock market: a dynamic causality analysis on the European market. Economics Letters 118, 199-202. http://dx.doi.org/10.1016/j.econlet.2012.10.010 (MNiSW- 20 pkt) (IF 5-Year 0.682). Papież, M., & Śmiech, S. (2013). Economic Growth and Energy Consumption in Post-communist Countries: a Bootstrap Panel Granger Causality Analysis. Dynamic Econometric Models 13, 17-36. http://dx.doi.org/10.12775/DEM.2013.003 (MNiSW-8 pkt). Papież, M. 2011. Wykorzystanie modelu Lee Cartera do prognozowania współczynników zgonów w Polsce (w:) Balcerowicz-Szkutnik, M., (red.) Współczesne problemy demograficzne w dobie globalizacji – Aspekty pozytywne i negatywne. Zeszyty Naukowe Wydziałowe Uniwersytetu Ekonomicznego w Katowicach, Studia Ekonomiczne 95, s. 83-91. Papież, M. 2011. Analiza zależności między starością demograficzną a ekonomiczną w wybranych krajach Unii Europejskiej w latach 1999-2010, Polityka społeczna - Numer specjalny, część I, 28-31. Papież, M. 2011. Analiza przyczynowości na rynku ubezpieczeń życiowych w latach 2003-2010 (w:) (red.) W. Ronka-Chmielowiec. Prace Naukowe Uniwersytetu Ekonomicznego we Wrocławiu 228, 383−393. Papież, M. 2011. Analiza wpływu zmian PKB na umieralność w Polsce w latach 1970-2008 (w:) Pawełek, B. (red.) Osiągnięcia i perspektywy modelowania i prognozowania zjawisk społeczno-gospodarczych. Wydawnictwo Uniwersytetu Ekonomicznego w Krakowie, Kraków. Papież, M. 2010. Zastosowanie stochastycznego modelu Cairns, Blake, Dowda do prognozowania oczekiwanej długości trwania życia, Zeszyty Naukowe, Prace z zakresu prognozowania. Uniwersytet Ekonomiczny w Krakowie 813, 45-68. Papież, M. 2010. Wpływ niejednorodności populacji na ryzyko portfela zakładów emerytalnych, [w:] Ronka-Chmielowiec, W. (red.) Ubezpieczenia emerytalne, społeczne i metody aktuarialne. Prace Naukowe Uniwersytetu Ekonomicznego we Wrocławiu 106, 127-135. Papież, M. 2010. Wpływ niejednorodności populacji na ryzyko demograficzne w portfelu ubezpieczeń na życie [w:] Trzaskalik, T. (red.) Modelowanie preferencji a ryzyko ’09, Prace Naukowe Akademii Ekonomicznej im. Karola Adamieckiego w Katowicach, Katowice, Wydawnictwo Akademii Ekonomicznej im. Karola Adamieckiego, 183-198. Denkowska, S., Papież, M. 2010. The Analysis of Mortality Changes in Selected European Countries in the Period 1960-2006, Statistics in Transition -new series, 11 (3), 563—584. Papież, M. 2009. Stochastyczne modele umieralności w prognozowaniu oczekiwanej długości trwania życia w krajach Europy Środkowej i Zachodniej [w:] Pociecha, J. (red.) Współczesne problemy modelowania i prognozowania zjawisk społeczno-gospodarczych, Studia i Prace Uniwersytetu Ekonomicznego w Krakowie 2, 223 – 238, Wydawnictwo Uniwersytetu Ekonomicznego w Krakowie, Kraków. Papież, M. 2009. Metoda osłony przed ryzykiem długowieczności dla portfela ubezpieczeń na życie i zakładów emerytalnych [w:] Jajuga, K., Ronka-Chmielowiec, W. (red.) Inwestycje finansowe a ubezpieczenia tendencje światowe a rynek polski, Prace Naukowe Uniwersytetu Ekonomicznego we Wrocławiu 60, 378-385, Wydawnictwo Uniwersytetu Ekonomicznego we Wrocławiu, Wrocław. Papież, M. 2009. The impact of heterogeneity of a population on a life insurance portfolio [in:] “Aktuárska veda v teórii a v praxi” Bratislava : Vydavateľstvo EKONÓM,s. 28-35. Papież, M. 2008. Ryzyko długowieczności dla portfela ubezpieczeń na życie i zakładów emerytalnych, [w:] Ronka-Chmielowiec W. (red.) Ubezpieczenia w XXI wieku, Prace Naukowe AE we Wrocławiu 1197, 327-335. Wydawnictwo Akademii Ekonomicznej im. Oskara Langego we Wrocławiu, Wrocław. Papież, M. 2008. Możliwość wykorzystania modelu Lee-Carter do szacowania wartości w dynamicznych tablicach trwania życia, Zeszyty Sekcji Analiz Demograficznych PAN, 18, 55-71. Papież, M. 2008. Wykorzystanie stochastycznych modeli umieralności do budowy dynamicznych tablic trwania życia. [w:] Jajuga, K., Ronka-Chmielowiec, W. (red.) Inwestycje finansowe a ubezpieczenia tendencje światowe a rynek polski, Prace Naukowe Uniwersytetu Ekonomicznego we Wrocławiu 18, 79-87, Wydawnictwo Uniwersytetu Ekonomicznego we Wrocławiu, Wrocław. Papież, M. 2008. Metody oceny ryzyka demograficznego i inwestycyjnego dla portfela ubezpieczeń na życie, [w:] Trzaskalik T. (red.) Modelowanie Preferencji a Ryzyko `07, Prace Naukowe Akademii Ekonomicznej im Karola Adamieckiego w Katowicach, Wydawnictwo Akademii Ekonomicznej w Katowicach, 361-376, Katowice. Papież, M. 2008. Analiza przestrzenno-czasowa rynku pracy w okresie starości ekonomicznej w Polsce w latach 1999-2005 , Zeszyty Naukowe AE w Krakowie Prace z zakresu prognozowania 797, 52-73. Papież, M. 2007. Wpływ procesu starzenia się ludności na ryzyko w ubezpieczeniach na życie [w:] Jajuga, K., Ronka-Chmielowiec, W. (red. )Inwestycje finansowe a ubezpieczenia tendencje światowe a rynek polski, Prace Naukowe AE we Wrocławiu 1176, 298-307. Wydawnictwo Akademii Ekonomicznej im. Oskara Langego we Wrocławiu, Wrocław. Papież, M. 2007. The Application of Lee Carter Model for Selected Populations in West and Central European Countries [w:] “Aktuárska veda v teórii a v praxi” Bratislava : Vydavateľstvo EKONÓM. Papież, M. 2007. Ageing Process of Population and Labour Market – Comparative Analysis in the European Union Countries in the years 1996-2005, [w:] Sodomova, E. (ed), Education of Quantitative Mathematical-Statistical Methods at the Universities of Economics Referring of Future Needs. Fakulta Hospodárskej Informatiky, Ekonomickej Univerzity v Bratislave, Bratislava, 127-136. Papież, M. 2007. Wpływ procesu starzenia się ludności na zmiany zachodzące na rynku pracy na przykładzie wybranych krajów Unii Europejskiej w latach 1998-2004. Zeszyty Naukowe AE w Krakowie Prace z zakresu prognozowania 740, 52-73. Papież M., Wanat S. (2004), Wybrane metody analizy zależności w portfelu ryzyk ubezpieczeniowych, [w:] Inwestycje finansowe a ubezpieczenia tendencje światowe a rynek polski, (red.) Jajuga K., Ronka-Chmielowiec W., Prace Naukowe AE we Wrocławiu, nr 1037, tom 2, Wydawnictwo Akademii Ekonomicznej we im. Oskara Langego Wrocławiu, Wrocław, s. 100 –109. Papież M., Wanat S. (2004), Wybrane metody analizy i modelowania zależności w ubezpieczeniach, Zeszyty Naukowe AE w Krakowie nr 666 s. 53-78. Papież M., Wanat S. (2003), Zastosowanie teorii zbiorów rozmytych w wyborze optymalnej prognozy wysokości szkód w: „Inwestycje finansowe i ubezpieczeniowe – tendencje światowe a rynek Polski”, pod red. W. Ronki-Chmielowiec, K. Jajugi, Prace Naukowe AE we Wrocławiu, nr 952, Wrocław, s. 227-235. Papież M., Wanat S. (2003), Wykorzystanie funkcji copula w analizie zależnych ryzyk ubezpieczeniowych w: „Inwestycje finansowe i ubezpieczeniowe – tendencje światowe a rynek Polski”, pod red. W. Ronki-Chmielowiec, K. Jajugi, Prace Naukowe AE we Wrocławiu nr 990, Wrocław, s. 299-306. Papież M., Wanat S. (2003), Some Methods of Modelling Dependencies in Insurance Risk Portfolio w: Poistná matematika v teórii a v praxi, Fakulta Hospodárskej Informatiky, Ekonomickej Univerzity v Bratislave, Bratislava, pp.80 – 88. Papież M., Wanat S. (2003), Wykorzystanie funkcji połączeń w ocenie ryzyka w ubezpieczeniach na życie. [w:]Modelowanie Preferencji a Ryzyko `03” pod red. T. Trzaskalika, Prace Naukowe AE w Katowicach, Wydawnictwo Akademii Ekonomicznej w Katowicach, Katowice, s. 473 – 489. Papież M., Wanat S. (2001), Claim costs forecast – fuzzy set theory approach,„Poistná matematika v teórii a v praxi”, Bratislava, pp. 70–79. Papież, M., Śmiech, S. (2015). Dynamic steam coal market integration: Evidence from rolling cointegration analysis. Energy Economics, 51, 510-520. http://www.sciencedirect.com/science/article/pii/S0140988315002297 (MNiSW-45 pkt) (IF 5year 3.374). Śmiech, S., Papież, M., Dąbrowski, M. A. (2015). Does the euro area macroeconomy affect global commodity prices? Evidence from a SVAR approach. International Review of Economics & Finance, 39, 485-503. http://www.sciencedirect.com/science/article/pii/S1059056015001197 (MNiSW-25 pkt) (IF 5year 1.397). The National Science Centre – 2015/17/B/HS4/02681 ( 2016 -2019). Papież, M., Śmiech, S. (2015). Modelowanie i prognozowanie cen surowców energetycznych. Wydawnictwo C.H. Beck, Warszawa. Śmiech, S., Papież, M. (2014). Energy consumption and economic growth in the light of meeting the targets of energy policy in the EU: The bootstrap panel Granger causality approach. Energy Policy 71, 118–129, http://dx.doi.org/10.1016/j.enpol.2014.04.005, (MNiSW-35 pkt) (IF 5year 3.402). Causal relations between nominal exchange rates and their fundamentals in European emerging economies - an approach based on the class of present-value models. The National Science Centre – 2013/11/B/HS4/00489 ( 2014 -2015). Dąbrowski, M.A., Papież, M., Śmiech, S. 2015. Causal relations between nominal exchange rates and monetary fundamentals in Central and Eastern European countries. The Economics of Transition 23 (1), 45–73 http://onlinelibrary.wiley.com/enhanced/doi/10.1111/ecot.12055/ (MNiSW-25 pkt) (IF 5year 1.051). Dąbrowski, M.A., Papież, M., Śmiech, S. 2014. Exchange rates and monetary fundamentals in CEE countries: evidence from a panel approach. Journal of Macroeconomics 41, 148 - 159 http://dx.doi.org/10.1016/j.jmacro.2014.05.005 (MNiSW-25 pkt) (IF 5year 0.968).